There are two reasons for coating an intake manifold. The first would be Performance, the second Appearance. Performance: In this instance, you are dealing with heat that is generated by the engine. You will also acquire heat from the hot oil that may be tossed up under the underside of the intake manifold. This means we want to apply a thermal barrier to the bottom of the intake manifold, the flange area where it would bolt to the head and also the flange area where the carburetor would bolt to the intake manifold. This will reduce the amount of heat that enters the manifold itself, keeping the manifold cooler. Typically, a normally aspirated engine will see a 1% improvement in power for every 10 degree drop in carb air inlet temperature. A Turbo charged engine will see a 2% increase. 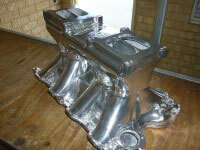 Keeping the manifold cooler than normal allows an engine to generate more horse power. In addition to this, you would coat the top of the manifold with a thermal dispersant. This means that the heat that does get into the intake manifold will be more rapidly dispersed into the air moving over it, thus cooling the intake manifold further. This gives you a greater chance of creating more horse power by reducing the inlet temperature. 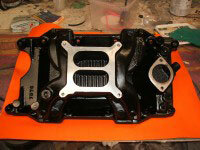 You can also coat the inside of the runners in an intake manifold. Appearance: If someone is looking for more show and they like a bright, polished appearance, then Ceramic chrome, as an example, can be used. Since Ceramic chrome is a thermal barrier, we recommend that you coat the bottom and the top. In this way, while you’re inhibiting the amount of heat that can be dispersed from the top of the manifold because of it being coated, you’re reducing the amount of heat that can be absorbed by the manifold because of the same coating on the bottom.